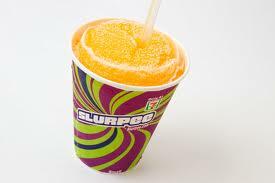 Tomorrow, May 23rd, you can receive a free Slurpee from 7-11. They are promoting their new “Sugar-free” Slurpee made with Splenda. Fewer calories? Yes. Better for you? No. Still no nutritional value with possible adverse side effects from a processed substance. No thank you. I recently posted my recipe for a homemade version of a Slurpee, AND Publix just so happens to have Old Orchard Frozen Juice and Ritz seltzer on sale to make it! How “convenient”!